Shedding the limitations of geographies professionals passionate about service design come together at 106 venues giving shape to their ideas. 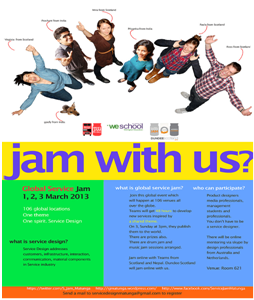 Welingkar Institute of Management Development and Research has announced its second Global Service Jam. The global event that sees participation from over 106 venues across the globe is slated for 1- 3 March 2013.
components of a service. It aims at improving quality of the service and the interaction between service provider and customer more fruitful and satisfying. And who wouldn’t like keeping their customers happy and satisfied. The Jam that derives its name and nature from the musical jamming sessions has world wide participation. It brings together professionals from multitude background. They are passionate about design based approach to problem solving and creativity. Teamed up, they put their heads together in spirit of experimentation, competition and cooperation configuring new service ideas based on the theme that is announced just at the outset. These ideas can be in shape of a service, campaign, product or even website or portals. Jammers at Welingkar Mumbai will have co- jammers from Nepal and Scotland in their groups. They will be mentored and faclitated in their efforts by design experts at Welingkar along with design professionals from Australia, Netherlands via Skype. The service designers will share their configurations with the world as they upload these Sunday afternoon, after 48 hours of robust brainstorming . The thrills of a Global Service Jam include working with professionals with diverse core competencies towards a common goal. You meet people who are completely new and possibly have different perspectives than yours. Each team tries to make the most of the strengths each one brings to the table. This crossectional play of talent and competencies at times unfolds possibilities of distantly placed groups coming togther professionally working on common ventures and dream projects. It broadens one’s perspective on the world. Besides it gives you better insights into the mind of your customers. The icing on the cake comes in shape of prizes at the end of the event.